Helping hardworking Americans a top priority for the Community Action Association of PA. We strongly urge congress to make expanding the Earned Income Tax Credit (EITC) for low-wage workers who are not raising children a top priority. The EITC is one of our nation’s best tool to promote work and reduce poverty. 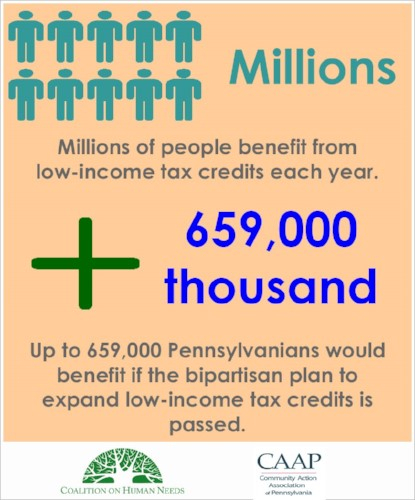 In Pennsylvania, 970,000 working households receive the EITC, which helps them keep more of what they earn, meet their basic needs, and get ahead. But, the EITC does not presently help low-wage workers aged 21-24 who are not raising children. And it largely shuts out those workers aged 25 and over, as their EITC is too small to offset their income and payroll taxes. Someone in this group working year-round, full-time at the minimum wage gets virtually no EITC. Their inadequate or nonexistent EITC fails to protect these low-wage workers from being taxed into or deeper into poverty, leaving them with too little take-home pay to cover food, housing, transportation to work, and other necessities. It also fails to provide a meaningful work incentive, which is a hallmark of the EITC’s pro-work success for workers raising children. There is growing bipartisan support in Congress to address this serious problem in this part of the EITC. Various proposals in this Congress—including one known as the Working Family Tax Bill drafted by Senator Sherrod Brown (D-OH), which we are grateful Senator Bob Casey (D-PA) has co-sponsored (S. 1012)—would fix this problem by lowering the eligibility age to 21 and boosting the maximum credit for workers not raising children. Sen. Brown’s proposal (included in S. 1012) would help 659,000 low-wage workers in our state, including 32,000 current and former members of the military, 200,000 young workers aged 21-24, 72,000 workers in rural areas, 47,000 Latino workers and 91,000 African American workers. A similar but less generous proposal from House Speaker Paul Ryan (R-WI) would reach 554,000 in Pennsylvania and would still make significant progress toward the goal of not taxing workers into poverty. A diverse group of workers would benefit from such an expansion, including working parents who don’t live with their kids but want to help provide for them, veterans and members of the military, and young workers trying to get a foothold in the labor market. We recognize it’s too early to tell what specific opportunities there may be in Congress in 2017 to address the EITC, but we are hopeful that PA's Congressional Delegation will pursue any and all options. For example, President-elect Trump has indicated one of his top priorities for the first 100 days is a jobs/infrastructure bill. This legislation seems likely to present a prime opportunity to expand the EITC for these workers, given the EITC’s job-promoting benefits and the bipartisan support for this proposal. Extending the pro-work success of the EITC to this largely left-out group would fit perfectly with increasing investments in infrastructure. Expanding the EITC is the kind of pro-worker and anti-poverty legislative program that CAAP has long supported. And it’s an idea whose time has come. We believe—and we think most Americans believe—that no working American should be taxed into poverty. And that’s why we ask PA's Congressional Delegation to actively work to address this problem by expanding the EITC for low-wage workers not raising children.